Hello folks! Sorry about the blogging break! Been very busy lately, settling into the new job, also coaching soccer again, also a little bit of travel (a couple of days in LA helping my friend from England celebrate his 40th birthday), and a slow-down in the sketching (but only a slow-down, not an actual break…never an actual break!) Also I just have had a lot of things piled on top of the scanner and you have to move it to scan things and…excuses, excuses. So I am up super early today watching Tottenham beat Huddersfield (it’s 3-0 at half-time, Harry Kane is giving a masterclass) and it seemed like a good time to start catching up. 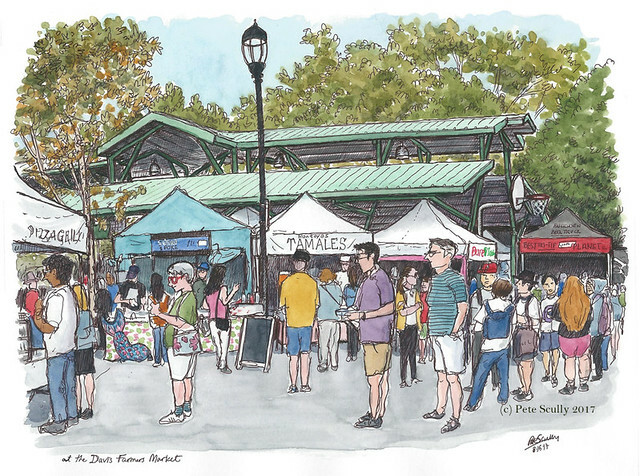 So, this sketch is of the Davis Farmers Market and I drew it at the August “Let’s Draw Davis” event, which are still going monthly, this one was organized by fellow Davis sketcher Alison Kent. 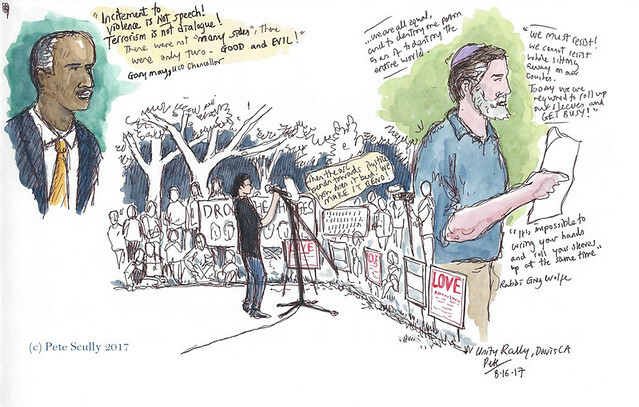 I stood and sketched this among the Wednesday evening ‘Picnic in the Park’ crowd. 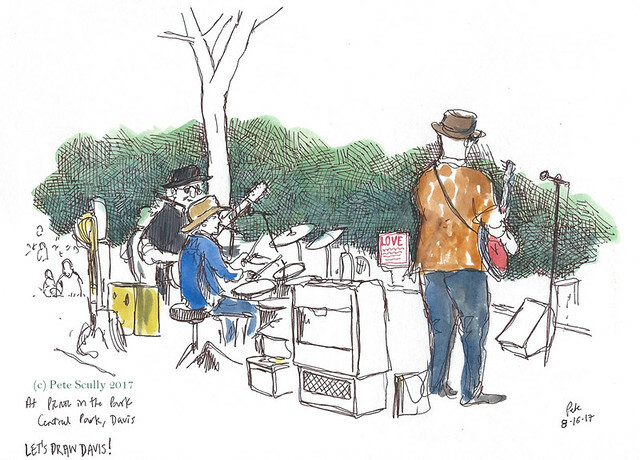 That’s what the Wednesday evening summer events at the Farmer’s MArket are called, they have music and bounce houses. 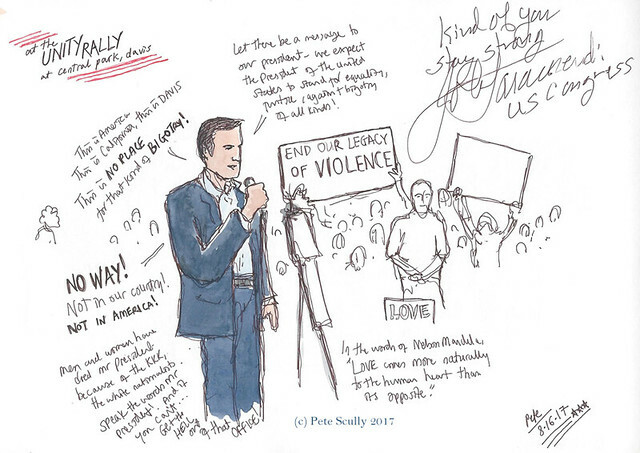 A few days later I added this sketch to the Pence Gallery’s annual Art Auction, and it sold!! I’m so glad, as I really enjoyed sketching this. The Farmers Market on a Wednesday after work is a nice place to hang out in this town. 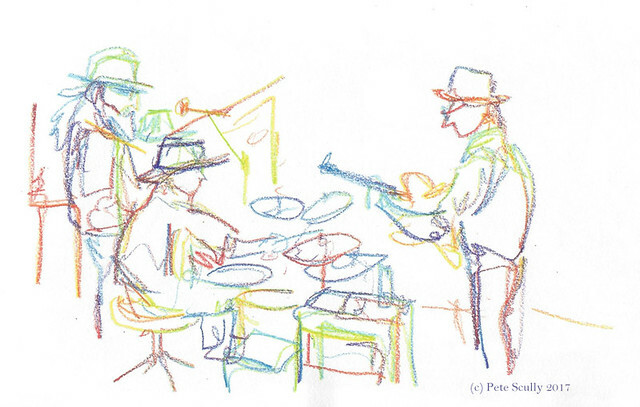 I did a couple of other sketches, of the band performing, using one of those multi-coloured pencils for the second sketch.